FAR too often do we take for granted that justice that is sought to be done must actually be seen to be done. While it takes such a humongous effort to do the doing by the guardians of law whom we call 'judges', it is for the man on the Clapham omnibus whom we call 'public' to do the seeing. Not only are the doing and seeing inextricably intertwined with one another, they are in fact very much dependent on each other. Both of them are not at all mutually exclusive. Any slight ill-intentioned opportunity to divide these two must be thwarted at once. After all, law is made to regulate the conduct of the people in a given society or polity. As members of the public, when we are expected to accord full and unmitigated obedience to the law, it must follow that we too have a right to demand that, justice, when done as a result of the adherence to the reading of the law by the judges, be made reasonably transparent and visible for it to safely escape any room for criticism or prima facie doubt over the impugned process in its dispensation. The recent scandalously charged incident is indeed a tragedy. It may and should serve as a great reminder to all of us that judges, despite the expectation of their personal lives in recluse are not invincible to public censure due to their choice to appear in public view. 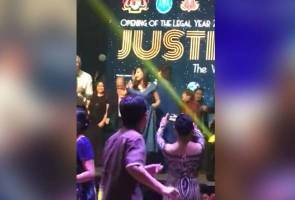 A short video showing at least Their Lordships Chief Justice of Malaysia and Chief Judge of Sabah and Sarawak sharing a stage with the Attorney General of Malaysia and few other members of the Malaysian Bar at the Opening of Legal Year Gala Dinner held at Kota Kinabalu, Sabah has since gone viral. More shocking is the fact that a member of the Malaysian Bar, who is presently being charged under Penal Code, was also seen cavorting onstage with the Attorney General of Malaysia, who, by virtue of powers vested in him under the Federal Constitution, functions as a Public Prosecutor. While their aims and objectivity per se may not be affected by the act of co-mingling, the process during which such aims and objectivity are arrived at may be called into question by the public, thereby giving rise to the reasonable notion of impropriety. It is my humble opinion that judges spotted fraternising with any parties who succumb to the pleasure of barristerial audience of the former in both of their professional capacities are in blatant breach of the Judges' Code of Ethics. For avoidance of doubt, such Code is not intended to deprive our judges of their social life in its entirety. An interdependence between the judiciary and the Bar with a view to further forging a camaraderie between these two entities has always been encouraged. Formal events attended by those involved in the administration of justice are no stranger to this deep-seated tradition. Any proposed halt thereto will therefore be undesirable. A restriction on judges is confined to an association with any official bodies devoted to the improvement of the law which does not potentially attract any public tendency to view our judicial institution as lacking in its gesture to maintain public confidence. The independence of the judiciary is not only without judicial responsibility but such concept extends to social accountability too. An act of a judge must be strictly controlled by his own inner conscience in that he ought to constantly ask his learned-self if his act should appear to be consistent with the trust and confidence of the public in himself. An answer given in the negative if acted upon regardless will invoke growing disrespect and sheer deficit in public awe and admiration of judicial integrity. While judges are to be seen as separate from the society, they too form part of the society. Their judicial image under close public scrutiny becomes a cause célèbre by sole and mere virtue of their professional existence as judges. Any acts therefore must be viewed against high probabilities of causing a dangerous compromise in judicial functions or worse, injustice. Room for speculation and rumour in the discharge of judicial responsibilities howsoever remote must be avoided at all costs. What can be more suspicious and inviting of public wrath than seeing an individual, a lawyer in particular, who stands accused in the court of law for an alleged crime, prancing about in a social event with a Public Prosecutor who is statutorily and constitutionally obligated to serve the interest of the State on behalf of a victim and whose charge the former answers, and a Chief Justice who heads a judicial institution whom both parties at trial in their quest for either a conviction or an acquittal appear before? The public is as important as the Bar and the Bench in the administration of justice. Any misunderstandings between these three components are deeply regrettable; for they run the risk of putting a stop to the attainment of desire that each unit very much yearns for – to wit, justice that must not only be done, but ought to appear to be manifestly and undoubtedly seen to be done. Dispensing the essence justice alone is not enough. Justice is said to have been successfully dispensed when it has also finally satisfied the appearance of justice.